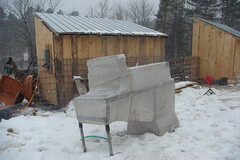 We just purchased a Phaneuf Hobby Evaporator, to make maple syrup this spring. It has the capacity to handle 50 to 100 taps, and we can get a bigger pan for it if that’s not big enough, one that can handle up to 200 taps. Woo! We drove over and picked it up yesterday, just barely before the ice storm started. So today, we walked around looking for sugar maple trees that are conveniently located and big enough to tap. We identified fifty of them along the driveway and around the house, when we ran out of marking tape. We know that there are at least as many again up Mack Hill and down the old logging trail, also quite close. So we should have a good number to start with this spring. We need to figure out where to place even a temporary sugar house. I’d really like to have at least a roof over the beast. We should have plenty of slab and firewood to keep the thing running. Frank’s now investigating collection things — do we use buckets, tubing, etc.? We are telling ourselves that sugar season is a time when we won’t have too much else going on here, so will be doable. It’ll be too early for lambing, for instance. Of course, having another structure to build is a big deal too, but that’s strictly for convenience, I guess, though I sure would like it. 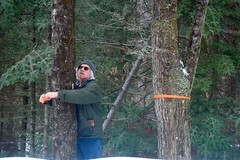 It just seems wrong to have a farm in New Hampshire and not make our own maple syrup. I love your blog and you two amaze me with how much you get done in a day! Thank you for writing. Holy cow—I have never seen one of those. I have to admit I would never have thought it was a syrup making outfit. Anyway Lisa—I am going to tag you as one of my 5 victims to tell 5 things about yourself AND then pass it along to 5 others. Any tips on identifying sugar maples in the winter? The bark is a lighter gray than red maple and the stems are bumpier with more moss. That said there are three or four trees out there that I’m really not sure whether they’re red or sugar maple and a couple oaks whose bark looks completely like sugar maple. A quick look at the branches will id the oaks.